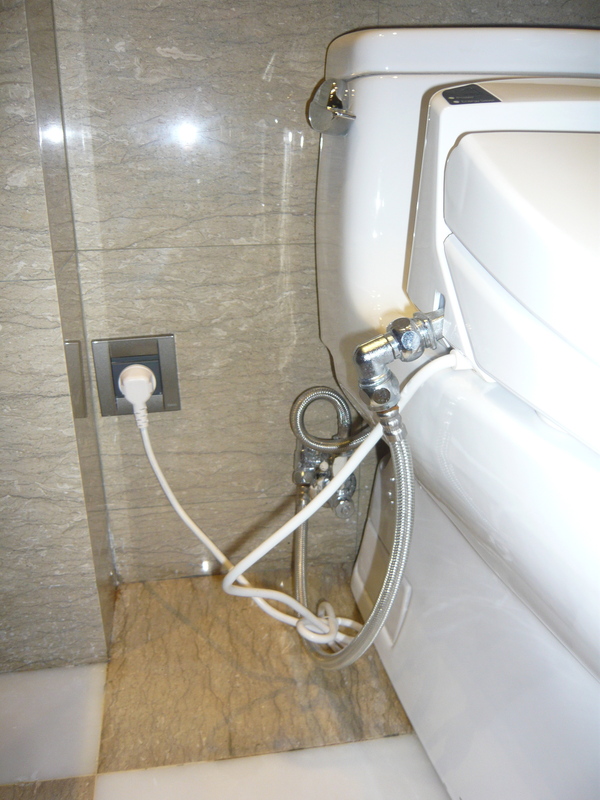 If you have ever traveled anywhere in Asia then you have certainly experienced the “curse of the Asian Toilet” before. Otherwise known as the squat toilet, it can be a brutal and stinky affair, especially for women who do not have the biological convenience that men do (yes, God must truly be a man!). I, myself, am well past any issues with the squat toilet. After traveling for three weeks in Nepal (in which over half of it was in remote villages in the Himalayas) I got broken in rather quickly to the “do’s” and “don’ts” of squat toilet etiquette. For example, Do carry toilet paper. Do always have hand sanitizer available (since there is seldom anywhere to wash hands let alone find running water). Do carry a flashlight. And most important: Do cover your noise (don’t you dare breathe in through your nose! Mouth breathing only) and Do, and I mean Do, try your best to not look down or spill. This is tricky for a female who isn’t equip like a male. But it is a reality that we must face especially when using a squat toilet! You definitely don’t want any accidents when you are traveling all day long wearing the same pair of pants! For me, going to China and dealing with the lack of the “western toilet” (as my beloved Nepali guide called it) was going to be nothing after three weeks of roughing it in Nepal. I’d seen plenty of bad, cold, smelly toilets. After awhile it was determined that sometimes mother nature was best. 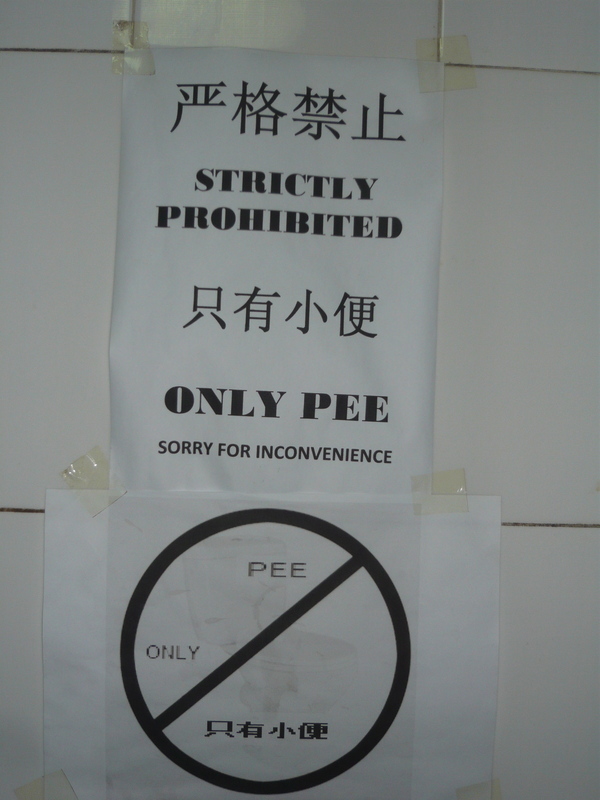 So, I thought amused that it was no big deal dealing with the Asian toilet situation during my travels. I’d done it, I’d mastered it and best of all, the hotel would most likely have a western toilet (unlike in Nepal where I went three weeks without one). What I found so incredibly fascinating in China was the controversy regarding the Asian toilet (especially before Beijing hosted the Olympics in 2008), the resulting growth of the public toilets (over 5,333 were added to prepare for the Olympics), the new rating star-standards of toilets, and last but not least, the hilarious commentary I saw about the wonder of the porcelain gods. I couldn’t get enough of toilets during my trip! Strolling along Beijing’s Chang’an Avenue in May, Kevin Born was drawn to an ancient Chinese-style building with delicate wooden carvings and wash paintings — only to find it was a public toilet. Inside, he found a granite floor, remote-sensor flushing, automatic hand drier and piped music. He found it difficult to believe that only three years ago when he first came to China, answering nature’s call was an experience not for the faint-hearted. “You had to take a deep breath and dash into the toilet. You held your breath and your head high, and never looked down. Then you’d dash out quickly for another gasp of fresh air. All within 30 seconds,” recalls Kevin, 30, an engineer from Germany. The city launched a three-year campaign — with a 400-million-yuan (57 million U.S. dollars) investment — to modernize its public toilets in 2005 as part of its effort to prepare for the 2008 Olympic Games. With 1,000 new public toilets being built and renovated each year, the fetid back-street privies are being replaced with clean, well-maintained flush toilets. 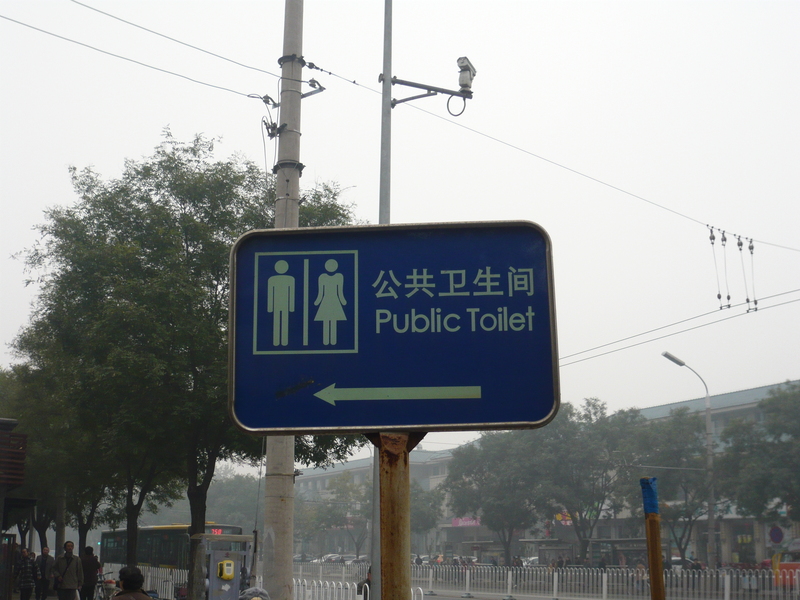 Now, Beijing is flushed with pride that all the 5,333 public toilets, boasting standardized white male and female figure signs, are available within a five-minute walk of any downtown location. In addition, there will be 700 toilets in Olympic venues by the time the Beijing Games start and an additional 800 nearby. Now it is time for a few of my best toilet shots (no worries….they are all flushed) as well as another interesting article I found regarding the history of toilets in China (including the introduction of the star rating system) and the push of the Chinese Government to vamp up the number of public toilets in preparation for the Olympics. Happy reading! (And please….don’t read this post on the toilet!). Inside our hotel lobby, we had nice clean western toilets. Yet I could not stop laughing over this “lost in translation”! 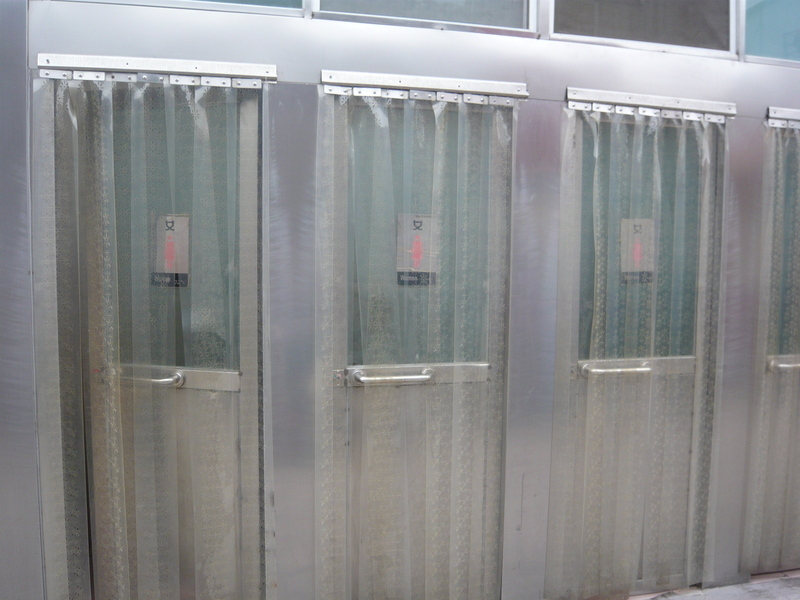 One of thousands of new, convenient public toilets made available throughout Beijing in preparation for the 2008 Olympics. It was fabulous having so many public toilets available! Most were all the traditional squat toilet, however, they were clean, not sticky and readily available everywhere. It made a day of sightseeing or an evening of drinking beer easy. (Don’t you hate it when you are traveling and desperately need to use the bathroom but can’t find one anywhere?! Not possible in Beijing, thanks to the thousands of newly minted public toilets). 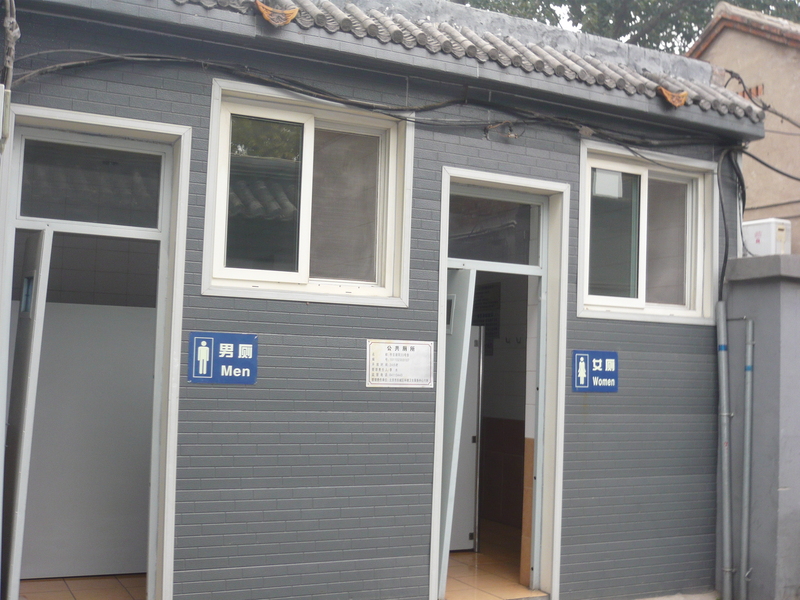 More public toilets located in the famous Hutongs. They even had sinks with working running water! Some had toilet paper too….bonus! See, they are now nice and clean! Not the old nasty ones that left people ready to pass out. Locals and tourists alike embraced the availability and cleanliness of the new toilets. Different styles of public toilets that were “stand-alones” and much nicer than our “Port-a-Pottys” back at home. I could not resist grabbing my camera and taking this picture of the sign in the bathroom at one of the restaurants we ate at in Beijing. Too funny! It was not posted once but twice! Guess they meant business! 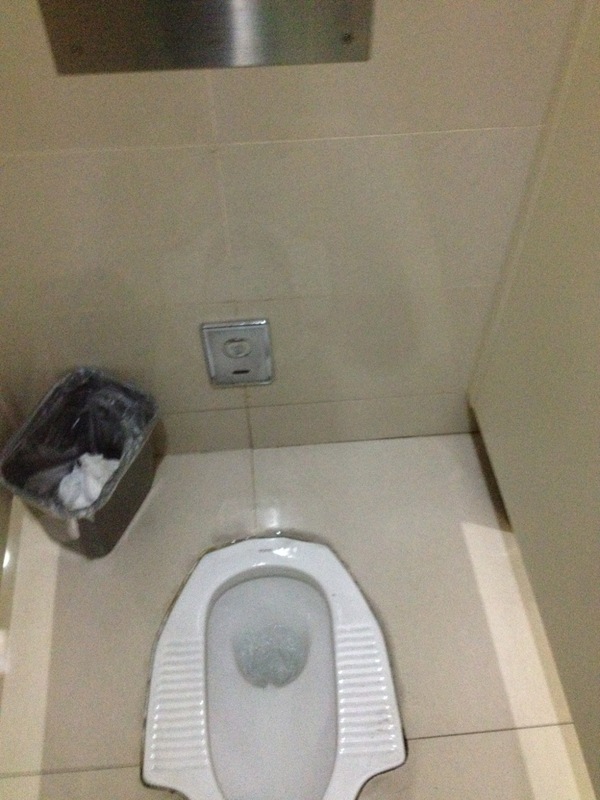 In Shanghai, I nearly fell off my (toilet) seat when I realized that (a) it was heated! 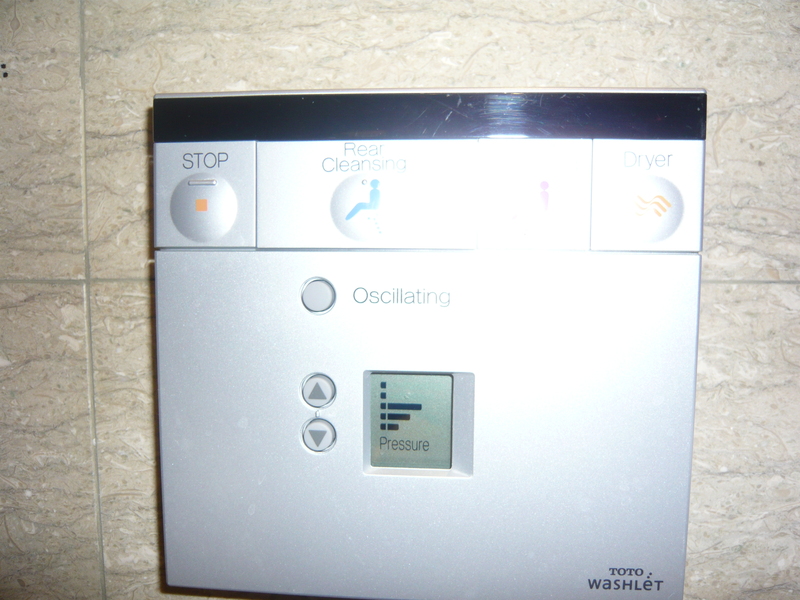 (b) it had a “rear cleansing” option and (c) it had a dryer! Now that is a little disturbing, isn’t it. (No, I did not try any of these services). The toilet was constantly heated to a warm 90 degrees F. Guess they want you to stay seated for a while and enjoy! Ha! Stay tuned…enough silly business. I’m starting to remind myself of my kids and their non-stop adoration of “potty talk”! Next post will be on Beijing’s fabulous Hutongs! Thanks for reading! LOVE the toilet tutorial! I had a few too many squat toilets myself in Thailand, Vietnam, and India! I truly adore this post, Nicole! Haha love this post, especially the photos!!! I like to take photos of the views from toilets and have some stunning ones taken out on the Mongolian steppe and in Guatemala. Don’t think I’ll be doing a post on them in the near future though! I’m pretty used to squat toilets after extensive travel in Asia and having one in my house for 3 years while I was living in Thailand. I actually think they’re more hygienic but you do have to be careful your feet don’t slip in after sampling the local brew! Get a workout going to the bathroom – Squats Anyone:) Loving the post and thanks for sharing! A heated toilet seat, that’s genius! There are still some squat toilets in Italy. I avoid them where possible. 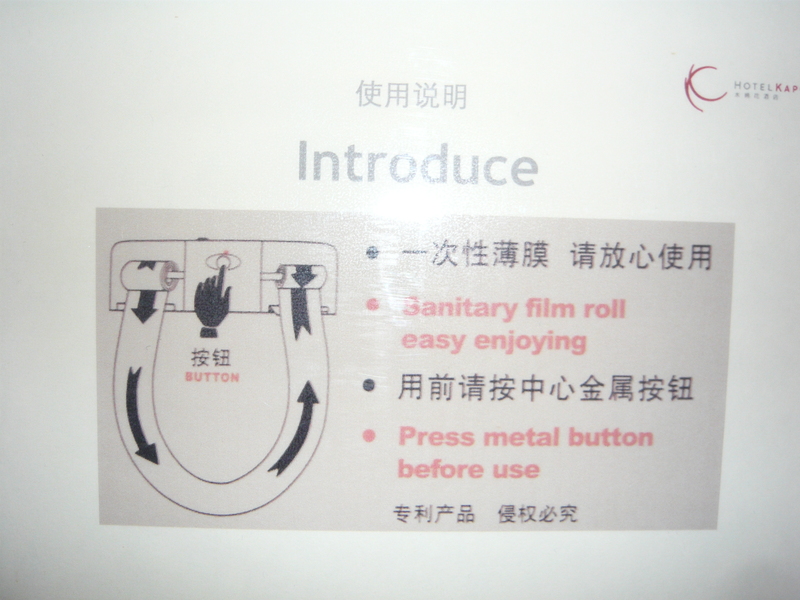 I really appreciate the efforts which have been done by Chinese government to educate their people how to use toilet. However until now I still have that ‘horror’ for imagining how toilets in China look like because some of my friends and relatives who have been there all said the same thing: toilets in China are the grossest in the world. But I’m sure it takes time to change the habits which have lasted for generations. There is nothing wrong with their habits. They dont need to change anything. Us westerners are the ones who need to adapt the squat toilets. The western toilet is the number one cause of colon cancer. Why do you think almost nobody In the far east gets colon cancer and about 150,000 people in the US get it every year. I didn’t say there was anything wrong with their habits. I just said it was very hard as a woman to adapt is all. Men have it way easier as thy can stand to pee whereas women have to squat always. After two days I was good to go! And you are probably right that it may be cleaner. But if so why are so many NGOs complaining about the squat toilets and trying to modernize them? Anyway thanks for stopping by! We also probably get colon cancer due to our fatty highly processed diet here! Look how fat Americans have become. Almost 30% obese!